What does it mean to love a place? I am very excited about this post—it’s the fourth in the Love List Project series, and the first ever guest post at Halfway to Normal. I really couldn’t be more pleased to have my dear, long-time friend and talented writer, Carmen Scheidel, be the one sharing herself and her words here. She immediately embraced what the #lovelist concept is all about, and has been exploring all that she loves with the curiosity, reverence and joy I hope we all have. Carmen’s post was inspired by this #lovelist tweet earlier this week: “I read the word Iowa this morning and felt a pang. I loved that sweet old place. #lovelist” I responded: “what did you love about it? the person you were? the things you were doing? the friends you had? the feel of the place?” Here is Carmen’s response. I hope it inspires you to share with us a place you have loved, from your past or present. I moved in the fall of 1990, when I was 20, a junior in college. I had just spent the summer in Italy and had a week to pack up and move to Iowa City. My dad drove me in the truck 391 miles from Grand Rapids, Michigan down around Chicago and west on I-80, to Church Street and Dubuque at the bank of the Iowa River. There I was, plopped down of my own volition. A couple of semesters later, I was there walking around my new home. Pearson’s pharmacy had a soda fountain in the back that sold ham salad sandwiches and malted milkshakes. The gas station one block up had a tiny sliver of dirt where cornstalks grew up like peonies. The winner of the Iowa Pork Queen Contest smiled out at me from snapshots posted on a restaurant window. The place felt outsized in its wholesomeness. It felt safe. Yet I was far from home and it occurred to me for the first time that I didn’t know a single person. I soon learned that Iowa City was a Mecca for all of the whip-smart misfits who didn’t exactly blend with their farm towns. Anyone gay, anyone artistic, anyone who wanted out or wanted more came there. You could find them at Prairie Lights Books. Breugger’s Bagels. Great Midwestern Coffee Shop. At the Deadwood, half biker bar, half student hang, the juke box spit out the Pretenders and the bartender shouted out their names—Michael!….John!—when they received calls on the payphone. The place was amazing to me. In winter, the skies were bright blue. It was freezing, of course, but the sun was out! I had never seen anything like this. In Grand Rapids, the winter weather patterns gathered force above Lake Michigan and created an opaque tent of stratus clouds—white—almost every day of the year. I never imagined my world could be another way. My extended family thought it was strange that I was there. Iowa? they asked. Iowa! No one on either side of the family really left a 20-mile radius of where our apple-farming forebears landed in the 1850s. When it was time for college, I can remember my dad pleading, It would mean the world to me if you finished your first year. I was the first of the generations in line to do it. I had been a B student in middle school, boldly proclaiming to my mother that I wasn’t going to be like my studious older sister, I was going to have fun! But my sister’s path had grown complicated in the years surrounding my parents’ divorce, and she quit med school before she really started. The little communal house on Church Street in Iowa City was my first home as an adult. My room was off the kitchen and felt like an oasis of pale green shag. I ran up my phone bill, read more than I ever had in my life, took long baths. I didn’t know what my career would be, but I knew I wanted one. I hid inside the room on Saturday mornings when the landlord came in to maniacally wax the living room furniture, cursing all of her renters as she went. By afternoon, she’d be gone and I’d join the Chinese and Japanese grad students in the kitchen to cook rice or ramen. Some nights, keeping up with reading and trying to comprehend Italo Calvino in Italian was just plain hard. I got frustrated one night and threw both the book and the dictionary across the living room like a dud firecracker that split into two. One of the grad students came in. “How is your night?” Good, I said. And she left. I picked up Creative Visualization which was in the stack on the couch next to me. What was the alternative? Start throwing a tantrum and call my dad to pick me up? I read the part about attaining what you want by envisioning it inside a beautiful pink bubble. I willed myself to master Calvino and get straight ‘A’s. I wrapped it all inside the bubble. If I was going to be in this faraway land, I wanted to make it worth it. On campus during finals week I was in a hurry to get to the admin office and trek down the hill to meet a professor, I caught myself walking just like my dad: with purpose, heels hard to the ground, charging across the sidewalk to get things done and feeling good about it. It made me miss everyone at home, yet I smiled, catching myself doing something so ingrained. I was a part of them, but I was also defining myself apart. I was experiencing a world of my own creation and I loved it! I took more and more literature classes and studied writing. Report cards came in with good results. (Really? It was that easy? Creating the life you want—I so wanted—was actually possible?) It took months for me to realize that it wasn’t a fluke. In Iowa City I first realized that I could land in a cornfield to study something as obscure and unmarketable in my rustbelt town as Italian literature. I could dream up a plan and make it happen. There was nothing so empowering. Years later I would use what I learned in Iowa to propel me to New York. The city would be a much tougher landing, but the drill was the same. Pick up that sweet little life and push ahead to what you want. I still love that quirky town in the middle of Iowa because it showed me that I could be whoever I wanted to be. Wow! What great questions you asked to evoke such a wonderful post! Carmen is my dearest friend, but I’ve never heard this story in this way before. What a wonderful, inspiring and motivating story. Kristen you sure know how to get to the crux of a an issue. Carmen, what a delightful read, you certainly have a special insight as to what makes you – you. I love Holland. I say this from the point of view of family connections. I love the inclusive feeling I have when there. The sights, smells, spaces were all foreign to me prior to knowing my hubs. Yet, somehow a return to Holland feels like a return home. What a fabulous post, Carmen! I feel like I can picture Iowa perfectly, the way you describe it, and I’ve never even been there. I can definitely understand how you can love a specific place because of the memories it holds. Carmen, I’ll never forget driving to Iowa City with Rick Wilde to visit you. He had a book to read for a class and wanted me to drive, but I couldn’t drive a stick shift. He sat me in the driver seat and told me to steer and when to push in on the clutch, and he shifted. I was so pleasantly surprised by Iowa City and I’ll never forget that old house. There is so much I DIDN’T know though. This essay really told me more than I ever realized. Thanks for sharing! from a geographer who loves thinking about and experiencing PLACES! You captured Iowa City and its promise and strengths beautifully. In the middle of farm country, Iowa City is a lovely enigma. Awesome and inspiring post, Carmen! I remember some of the places you mention from my brief visits to Iowa City. “Outsized in its wholesomeness” is a perfect phrase to describe the place. Bravo, Carmen. I remember your time in Iowa as when we got to become the truly close friends we remain today. Your experience there, like mine in Massachusetts (and all its ups and downs), gave us even more in common. I love the image of you walking like your Dad and all the new flavors of that experience I’d never heard you put quite this way. Thank you all for your comments! Writing out this memory and sharing it here has been a wonderful experience. Jennifer and Trina, I agree that Kristin has an incredible way of bringing things out of a person. It’s such a gift and her blog proves this daily. Scap, isn’t it amazing that friends can be close yet so much goes unsaid or unshared. 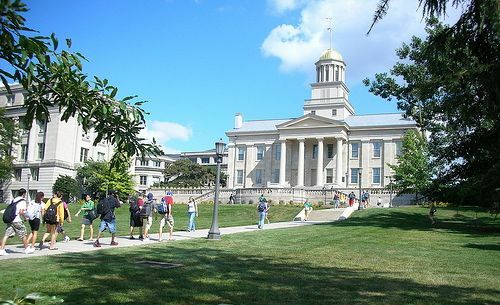 Meredith, you must visit Iowa City! It’s so special. Tina, I love that memory of you two visiting me. It meant so much to have your familiar faces there. Remember the one-armed pushups on the dining room floor? Cadry, thank you! Isn’t our country amazing with its little pockets of vitality spread across it? Ben, I’m so glad you read this and felt inspired — a shared connection over a place. Val, I feel so lucky to share such a long history with you! Lance, you’re welcome! I’m so glad you could relate. These memories are what shape us. Do you think we realize that as they’re happening? Kristin, thank you for this amazing opportunity to join your community here. It’s so fulfilling to share like this! Man, I quite like the report card thing – doing and finding the thing that one likes makes it simple (and fun) to do well. And those things are reflected positively in the report card. As now-out-of-school people, I wonder what the good, objective measurements are? (BTW, I’m not saying that report cards are always a good measurement) Money in the bank? Number of Facebook/Twitter Friends? Number of kids? Number of friends the kids have? I’m not too sure which is better, but the engineer in me always tries to find that objective measurement. All, thanks for being such a great community of support through your comments. How fun to have comments from so many new readers, too (who I assume found their way here because of Carmen). I have to conclude that Halfway to Normal’s first guest post was a big success! Look for another one soon, and keep thinking about what you love most in life, and why. Hi Carmen! That was an inspiring and enjoyable, well written story. Dave, I know what you mean. When I was a freelancer for seven years, one of the most difficult parts was not having a measurable sense of the work I was doing (no official reviews, no promotions). Now that I’m back in the full-time work world, I really value the kind of formal and informal feedback that happens there. As for the rest of life, ah, yes, I think it’s measured in the small moments that make up happiness. Kristin, I look forward to seeing future guest posts! Hi all! 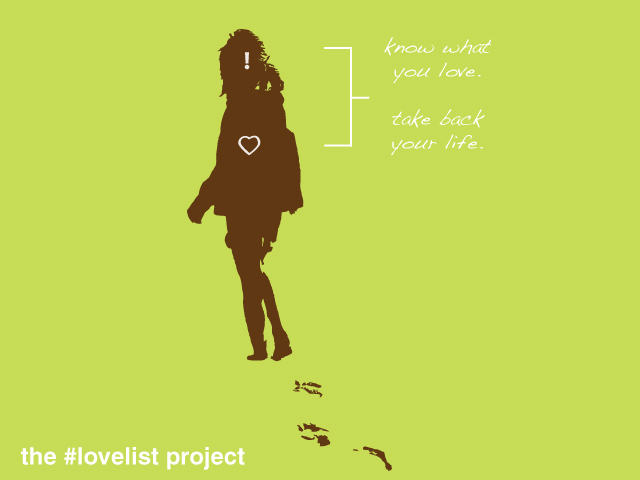 Someone with more than a million Twitter followers has taken over the #lovelist hashtag, so as of October 18, I’m going to start using the tag #thelovelist. If you’re on Twitter, please help spread the word!